We are giving away 25 prizes worth $3500.00 in our 25 Days of Christmas Giveaway! 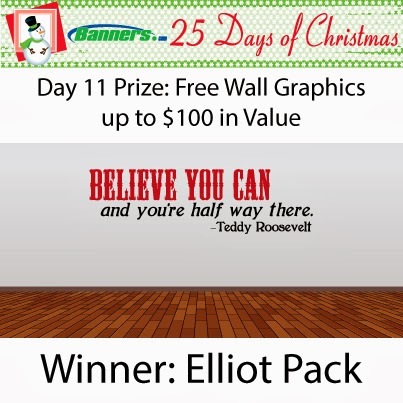 Our day 11 prize winner was Elliot Pack. 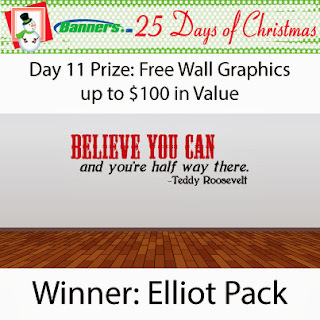 Elliot won Free Wall Graphics up to $100 in Value! The 25 Days of Christmas Giveaway runs through December 27, 2013. You must place an order to be entered into the contest. Each order you place will enter your name into the drawing. Prizes and winners will be selected at random each day. For more information, visit the 25 Days of Christmas Giveaway page.